Saturday was the fourth time in as many years that I’ve attended a daylong retreat with Edward Espe Brown, Zen abbot, author, cook, and altogether a charming and extremely funny man. In 1965, Edward became a student of Shunryu Suzuki Roshi, author of Zen Mind, Beginner’s Mind. 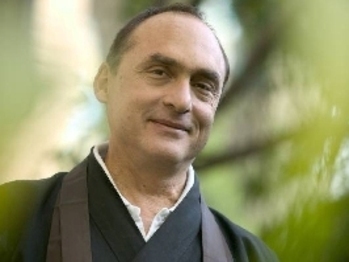 When his teacher founded the Tassajara Zen Center near Big Sur, Ed became the head cook (as an author, he is best know for the Tassajara Cookbook and the Tassajara Bread Book). Much of his learning took place in the kitchen, which gave him several unforgettable teaching stories. He relates his frustration in trying, without success, to produce a “perfect” muffin. He tried numerous recipes and variations. Everyone else thought they were great, but he was never satisfied. One day he managed to taste a muffin without his usual preconceptions and found it delicious. In that moment, he realized the source of his earlier discomfort – he’d been comparing his muffins to the “perfectly” shaped Pillsbury muffins he’d eaten as a kid. This discovery led to one of the core ideas he tries to communicate as a teacher: we have the choice of living our lives according to someone else’s recipe or trying to discover our own. “There is no by-the-book way for you to be you,” he says. Given this background, it’s no surprise that he started the day by saying, “I’m not going to give you any meditation instructions, because then you might try to follow them – and be looking over your shoulder to ask, ‘How am I doing?” The simplest instruction in Zen, “Just sit,” is the hardest to practice. Similar things can be said for writing or painting (“Just write/paint what’s in your heart”) – and many other areas of life as well. Such instructions (or lack thereof) assume the student knows the basics and some has experience. This was true for the group that gathered on saturday. It allows a generous teacher like Edward Brown to invite the student to seek what lies beyond a lifetime of learning how they are supposed to be. Ed once said, “What is precious in us doesn’t come and it doesn’t go. It is not dependent on performance.” That’s a nice sounding aphorism, the kind of thing I jot down in notebooks. Saturday’s retreat was a chance to test the waters, and as I hope I’ve made clear, at its best, Zen is about everything in our lives. I’d heard that Ed had written a new book, and it proved to be a fine example of finding our own way. He has several traditional books in print on Zen and cooking, and he also edited a collection of Suzuki Roshi’s teachings. When I’d read the title of his new book, By all Means A Zen Cautionary Tale, I assumed I’d be in for traditional reading. Instead, I was surprised and delighted to find he’d written a semi-fictional, semi-autobiographical story of his adventures a little pig hand puppet. In my next post, I’ll review By all Means, and after that, maybe the topic of conversing with inanimate things. Please stay tuned! PS: When I posted this, I forgot to add a link to Edward’s home page, Peaceful Sea Sangha. In particular, I recommend the recordings of his talks, which give the flavor of his teaching style, his concerns, and his humor. This entry was posted in Article, Authors, Buddhism, Spirituality and tagged 2014, authors, Buddhism, Edward Espe Brown, postaweek2014, puppets, spirituality, Zen. Bookmark the permalink. Love this, thank you for this. I’d never heard of him but will look into his work. This really resonated. Thank you! Oh thank you for this!! I bookmarked your page to go back when I have time to really look into this work. I’m very excited to do so, thank you!! E. E. Brown sounds like a most interesting man. I hope I can get to his books one day soon. By All Means sounds like a good place to start. Now, I think I need to bake some muffins. Thanks for an interesting post. Wait for the review (a few days) to see. For an imagined journey toward being oneself, it is funny and different and wise. It isn’t an introduction to meditation (nor does it try to be). Other authors cover that better.